After finishing Doki Doki Literature Club, I.....love it! It is one of the best and unique novel game I have ever played so I recommend it! To appreciate it, I drew Monika here.Hope you all like it. JUST MONIKA!!!!! Love your use of light! This is such a gorgeous drawing Josiah San! ;3 How did you do the lighting for the moons and fireflies? Thanks! I personally just draw circles and put some light effects on it, that's it! Then is it all right if you tell me the tools u using? The compositions is amazing!! So much detail going on its incredible and i love everything about it!! Lighting and shading both create a wonderful depth and liveliness to the artwork and brilliance!!! Thanks for such detailed comments! I am honored to hear that from you! Someone needs a hug from her Player-Kun! it's beautiful, sad, perfect lighting. Oof, rare to see a DDLC fan art on the browser. I love how you drew her hair! It's so pretty! I agree, it's a great game. Why Monika is crying ? 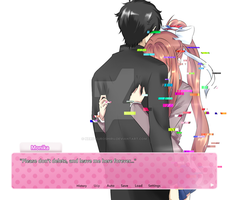 Haven't you played the game, DDLC? Thanks! You did help me to know what to improve on the drawing. For the hair, I need to learn from Google, lol. Excellent job here! Yeah you did great work! I hope the next time you'll do different poses. Maybe an Obari Pose like this www.google.com/search?q=Obari+… but I'm just suggesting that's all. Good afternoon Josiah, wonderful very wonderful. Hello, hope you're good too! Feel sad about her, you work changed my mind on Monica.